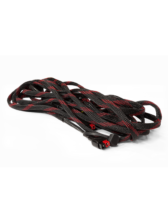 An extension cable is a must when you buy one of our solar panels. This 30A Anderson cable will ensure that you can get your solar energy back into your generator, wherever the sun is shining. 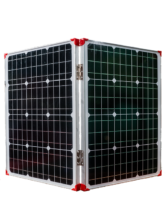 The FUEL-LESS™ Generator 100-Watt Foldable Solar Panel uses high efficiency solar cells made from quality silicon material, producing high conversion efficiency and long term output stability and reliability with virtually no maintenance. Rated for 20-year service life. 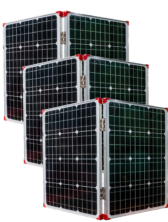 With this special offer you will receive two (2) 100-Watt Foldable Solar Panel, and one (1) Hand Crank. 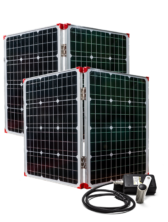 The FUEL-LESS™ Generator 100-Watt Foldable Solar Panel uses high efficiency solar cells made from quality silicon material, producing high conversion efficiency and long term output stability and reliability with virtually no maintenance. Rated for a 20-year service life.